Dr. Fatih Nayebi earned his Ph.D. degree in software engineering from École de technologie supérieure, Université du Québec by researching on Mobile Human-Computer Interaction, Software Engineering, and Machine Learning. Fatih has 15 years of industry experience in software engineering and architecture in various fields. He has developed various applications with Visual Basic, C++, C#, Java, MATLAB, Python, Objective-C, and Swift. He is also an enthusiastic Node, Scala, and Haskell developer. Fatih currently works as a Director, Consulting at CGI Group Inc, Montreal, and continues to his academic research and publications as a postdoctoral researcher at École de technologie supérieure. You can find him talking on Swift and Functional Programming at meetups such as http:/ /www.meetup.com/swift-mtl/, on GitHub at https://github.com/conqueror, and on Twitter as @thefatih. Kostiantyn Koval is a passionate software engineer with six years of experience. All this while, his main passion and work has been building iOS applications. During this time, he has build many applications, including games, enterprise apps, and big platforms. He fell in love with Swift from the beginning and keeps expressing it by sharing it with the world. Except iOS, he is also interested in other technologies and languages such as Scala, Clojure, LLVM, Ruby, JS, Web, and others. He is also the author of a Swift High Performance book, Packt Publishing. He loves open source and blogging. You can find him on GitHub at https://github.com/kostiakoval, his blogs can be read at https://medium.com/@kostiakoval or http://kostiakoval.git hub.io, and his Twitter handle is @KostiaKoval. Functional programming (FP) is getting a lot of attention as it eases many of the difficulties faced in object-oriented programming (OOP), such as testability, maintainability, scalability, and concurrency. Swift has a lot of functional programming features that can be easily used, but most Objective-C and Swift programmers are not familiar with these tools. This book aims to simplify the functional programming paradigms and make it easily usable for Swift programmers, showing you how to use popular functional programming techniques to solve many of your day-to-day development problems. 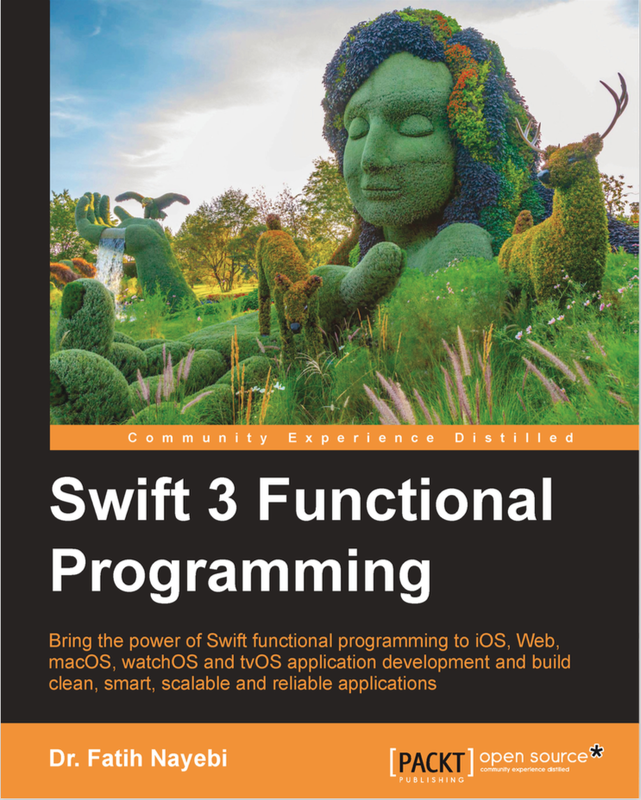 Whether you are new to functional programming and Swift or experienced, this book will provide you with the skills you need to design and develop high quality, easily maintainable, scalable, and efficient applications for iOS, macOS, tvOS, and watchOS. Through this book, you'll learn to build bug-free, maintainable code using functional programming. Chapter 1, Getting Started with Functional Programming in Swift, introduces functional programming paradigms, such as immutability, stateless programming, pure, first-class, and higher-order functions. This chapter will provide an introduction to the Swift programming language and functional programming paradigms in Swift. Chapter 2, Functions and Closures, begins with a definition of functions, continues with other related topics, such as function types and tuples, and finally concludes with more advanced topics such as first-class functions, higher-order functions, function composition, closures, currying, recursion, and memoization. Chapter 3, Types and Type casting, takes a look at types in general and explores reference versus value types in detail. We will cover topics such as value and reference type constants, mixing value and reference types, and copying. Then we will discuss the characteristics of value types. We will also cover the key differences between value and reference types, and how we should decide which one to use. We will continue by exploring equality, identity, type checking, and casting topics. Chapter 4, Enumerations and Pattern Matching, explains the enumeration definition and usage. We will cover associated and raw values and introduce the concept of algebraic data types. We will explore some examples to cover the sum, product, and recursion types. Also, in this chapter, we will explore patterns such as wildcard, value-binding, identifier, tuple, enumeration case, optional, type casting, and expression, along with related pattern matching examples. Chapter 5, Generics and Associated Type Protocols, teaches us how to define and use generics. We will also understand the type of problems generics solve. Moving forward, we will explore type constraints, generic data structures, and associated type protocols with examples. Chapter 6, Map, Filter, and Reduce, introduces the map, filter, and reduce methods in the Swift programming language with appropriate examples. These methods are used on arrays and can replace almost all uses of for-in loops and are more clear and concise. Chapter 7, Dealing with Optionals, familiarizes us with different techniques to deal with optionals. We will talk about built-in techniques to deal with optionals, such as optional binding, guard, coalescing, and optional chaining. Then we will explore functional programming techniques to deal with optionals. Chapter 8, Functional Data Structures, introduces you to the concept of functional data structures and explores examples of data structures implemented in functional way, such as Semigroup, Monoid, BST, LinkedList, Stack, and LazyList. Chapter 9, Importance of Immutability, explores the concept of immutability. We will look at its importance and benefits with the help of examples. Then we will look into cases for mutability and go through an example to compare mutability and immutability effects on our code. Chapter 10, The Best of Both Worlds – Combining FP Paradigms with OOP, covers object- oriented programming principles and paradigms. Then we will be introduced to protocol- oriented programming. Next, we will have an introduction of functional reactive programming and explore how to mix FP with OOP paradigms. Chapter 11, Case Study – Developing an iOS Application with the FP and OOP Paradigms, teaches us to develop a Todo backend and an iOS application, employing the concepts we have discussed so far. We will use functional programming techniques to parse and map the data, we will use functional reactive programming to reactively manage events in applications. We will also employ protocol-oriented programming and object-oriented programming techniques as well. To follow along with the examples in this book, you'll need to have an Apple computer with macOS 10.10 or higher installed. You'll also need to install Xcode version 8 beta 1 with Swift 3.0 Preview 1. The book is for iOS and macOS developers with basic knowledge of Swift programming. Prior knowledge of object-oriented programming is assumed. Code words in text, database table names, folder names, filenames, file extensions, pathnames, dummy URLs, user input, and Twitter handles are shown as follows: "The VerboseClass.h file defines an interface as a subclass of the NSObject class." New terms and important words are shown in bold. Words that you see on the screen, for example, in menus or dialog boxes, appear in the text like this: "Next, we will create a Single View Application project in Xcode." You can download the example code files for this book from your account at http://www. packtpub.com. If you purchased this book elsewhere, you can visit http://www.packtpu b.com/support and register to have the files e-mailed directly to you. 1. Log in or register to our website using your e-mail address and password. 2. Hover the mouse pointer on the SUPPORT tab at the top. 6. Choose from the drop-down menu where you purchased this book from. 7. Click on Code Download. 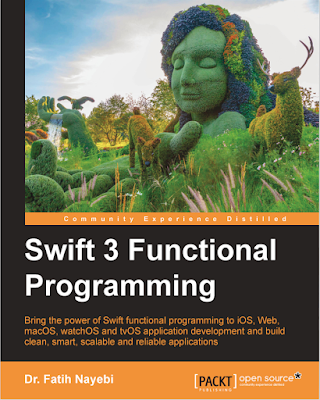 The code bundle for the book is also hosted on GitHub at https://github.com/PacktPu blishing/Swift-3-Functional-Programming. 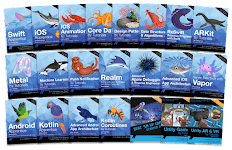 We also have other code bundles from our rich catalog of books and videos available at https://github.com/PacktPublishin g/. Check them out! We also provide you with a PDF file that has color images of the screenshots/diagrams used in this book. The color images will help you better understand the changes in the output. You can download this file from http://www.packtpub.com/sites/default/files/d ownloads/Swift3FunctionalProgramming_ColorImages.pdf. Although we have taken every care to ensure the accuracy of our content, mistakes do happen. If you find a mistake in one of our books-maybe a mistake in the text or the code- we would be grateful if you could report this to us. By doing so, you can save other readers from frustration and help us improve subsequent versions of this book. If you find any errata, please report them by visiting http://www.packtpub.com/submit-errata, selecting your book, clicking on the Errata Submission Form link, and entering the details of your errata. Once your errata are verified, your submission will be accepted and the errata will be uploaded to our website or added to any list of existing errata under the Errata section of that title. To view the previously submitted errata, go to https://www.packtpub.com/books/con tent/support and enter the name of the book in the search field. The required information will appear under the Errata section.